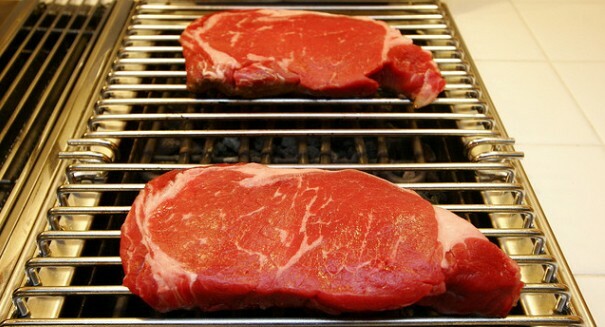 An alarming new study indicates that grilled and pan-fried meats are putting you at risk for cancer. It’s not been good news for BBQ lovers this week — as we reported recently, grilled meats are putting you at risk for kidney cancer. But why is grilling and pan-frying meats in particular so bad for you? The paper in question was funded by a grant from the National Institutes of Health and was published in the journal Cancer, and it pinpointed barbecued meats — or any meats cooked over an open flame — as linked with an increased risk of kidney cancer. It’s based on an examination of 659 patients at the University of Texas MD Anderson Cancer Center who had renal cell carcinoma compared to 699 healthy patients, and the research found that those who had cancer tended to eat more meat, and in particular meats cooked over an open flame. We’ve long heard about how unhealthy it is to eat too much meat — especially red meats and processed meats — and how it can lead to cancer, but this study indicates that it could lead to cancer for an entirely different reason: it’s the open flame that’s the culprit, as scientists think it may be introducing carcinogens into our diet. Carcinogens are a term for any substance that can cause cancer in living tissue due to the ability to disrupt cellular metabolic processes. They are very irritable to our system, and can take the form of known cancer causing substances like asbestos and tobacco smoke. Chemicals used to process and cure meat like bacon and sausages can contain carcinogens. And in this case, cooking food at high temperatures through grilling can add carcinogens similar to that found in cigarette smoke. Charring your food is a particularly bad idea. One way to get around it is to not overcook the meats and perhaps pre-cook them a bit in the microwave to shorten the time you need to put them on the grill or on a hot pan. It’s not a reason to abandon having a cookout with friends, as this is more of an effect seen after eating a large quantity of meats over time. Instead, focus more on balance. Eat a healthy diet, and you’ll experience plenty of benefits in addition to having a lowered risk of cancer. Diets high in meat may lead to an increased risk of developing renal cell carcinoma (RCC) through intake of carcinogenic compounds created by certain cooking techniques, such as barbecuing and pan-frying. As part of a new study from The University of Texas MD Anderson Cancer Center, published online this week in the journal CANCER, researchers also discovered that individuals with specific genetic mutations are more susceptible to the harmful compounds created when cooking at high temperatures. Renal cell carcinoma, the most common form of kidney cancer, is expected to be diagnosed in over 60,000 new patients this year and claim approximately 14,000 lives, according to the American Cancer Society. The incidence of RCC has been rising for several decades, and many suggest that a Western diet is partially, to blame. One of the proposed culprits of a Western diet is higher-than-average meat consumption, which has been linked to increased cancer risk. However, it has not always been clear why eating more meat elevates cancer risk, explained Stephanie Melkonian, Ph.D., postdoctoral fellow, Epidemiology and lead author of the study. A possible mechanism could be ingestion of meat-cooking mutagens, harmful compounds created when the meat is cooked in certain way. Cooking meat at high temperatures or over an open flame, such as when barbecuing or pan-frying, is known to result in the formation of carcinogens, including 2-amino-1-methyl-6-phenyl-imidazo(4,5-b) pyridine (PhIP) and amino-3,8-dimethylimidazo(4,5-f) quinoxaline (MeIQx). The kidney is a biochemically active organ responsible for filtering many harmful toxins from the body, and therefore it make sense to investigate the effects of dietary intake, including carcinogens, on kidney cancer risk, said Melkonian. To better characterize factors contributing to kidney cancer risk, the researchers surveyed the eating patterns and collected genetic information from 659 MD Anderson patients newly diagnosed with RCC and 699 healthy subjects recruited from the community. Based on survey responses, the researchers estimated meat consumption and exposure to meat-cooking mutagens with the help of a National Cancer Institute database. “We found elevated RCC risk associated with both meat intake and meat-cooking mutagens, suggesting independent effect of meat-cooking mutagens on RCC risk,” said Xifeng Wu, M.D., Ph.D, professor, Epidemiology and senior author of the study. Specifically, the results show that kidney cancer patients consumed more red and white meat compared to healthy individuals. Additionally, the researchers identified a 54 percent increased risk associated with PhIP intake and a nearly twofold increase associated with MeIQx intake. This is the first study to identify an association between kidney cancer risk and dietary MeIQx. The results suggest that cooking method is an important factor contributing to the elevated RCC risk associated with consuming more meat, as both red and white meat resulted in increased risk, explained Wu. This study was also the first to investigate connections between genetic risk factors and intake of meat-cooking mutagens for RCC. “By analyzing genes known to be associated with RCC risk, we found that high intake of these carcinogens may be particularly meaningful for a certain subgroup of the population,” said Melkonian. Individuals with variations in the gene, ITPR2, were more vulnerable to the effects of consuming PhIP. As this gene has previously been associated with kidney cancer and obesity risk, the results suggest this association may be partially explained by exposure to meat-cooking mutagens. Future experiments will seek to clarify the mechanisms linking mutagen intake and genetic susceptibility. The researchers cannot make specific recommendations regarding acceptable amounts of meat intake or exposure to meat-cooking mutagens, based on the current study. Exposures and consumption were analyzed on a relative, rather than absolute scale, and future studies will be needed to determine appropriate dietary intake. “Our findings support reducing consumption of meat, especially meat cooked at high temperatures or over an open flame as a public health intervention to reduce RCC risk and burden,” said Wu. The researchers do not suggest that individuals should remove meats completely from their diets, but rather consume it in moderation, as part of a well-balanced diet, complete with fruits and vegetables. When grilling or pan-frying meat, try to avoid charring it as much as possible, suggest the researchers. In addition to Melkonian and Wu, other authors on the all MD Anderson study include: Carrie R. Daniel, Ph.D., and Yuanqing Ye, Ph.D., both of Epidemiology; Nizar M. Tannir, M.D., Genitourinary Medical Oncology; and Jose A. Karam, M.D., Surena F. Matin, M.D., and Christopher G. Wood, M.D., all of Urology. The study was funded by grants from the National Institutes of Health (R01 CA170298), Center for Translational and Public Health Genomics, Duncan Family Institute for Cancer Prevention, The University of Texas MD Anderson Cancer Center, and the NCI R25T Postdoctoral Fellowship in Cancer Prevention.